It is possible to slim your muscles into a more traditionally feminine shape by changing your workout routine. In most cases it takes a lot of work to gain bulky muscles, particularly in women, but some people naturally have larger muscles than average. You could also have this problem if you are an athlete and have spent a lot of time training over a number of years. Regardless of why you are bulkier than you would like, it is possible to lose muscle mass by making some changes in the way you exercise. Perform aerobic exercise three to five times per week for 30 to 90 minutes per session. Aerobic exercise, sometimes referred to as cardio because of the positive effects on your cardiovascular system, is a good way to burn calories. If you burn more calories than you consume you will eventually begin to lose weight from fat or muscles. Choose moderate-intensity aerobic exercise such as running, aerobics, cycling, swimming and brisk walking. These types of exercises help you to create long, lean muscles that work efficiently to help you meet your fitness goals. 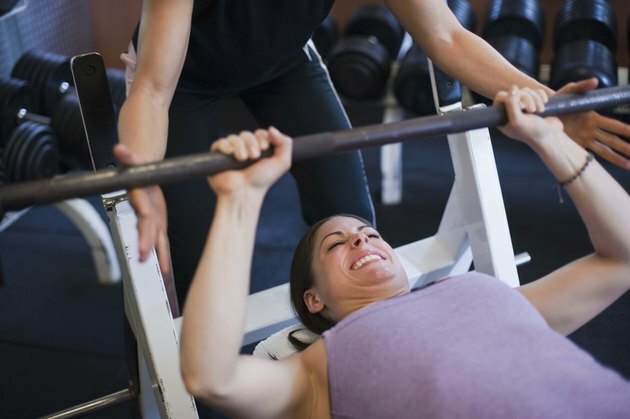 Skip weight training altogether or choose to use lighter weights when you lift. Your muscles need to be challenged in order to continue growing, or even to stay the same size, so lessening the load you place on them will decrease their size quickly. If you continue to lift, choose to do a higher number of repetitions since you are using lighter weights. Reduce the number of calories you consume overall. Large muscles need calories for maintenance and growth. Try to reduce your caloric intake by 250 to 500 calories per day to lose 1/2 to 1 pound per week. Eat healthy foods that include lean proteins, whole grains, low-fat dairy, good fats and plenty of fruits and vegetables. Avoid processed foods, soft drinks and sweets, and don't forget to drink plenty of water each day. Avoid comparing your body with other people's. A percentage of your body type is dependent on your genetic makeup, and cannot be altered by work at the gym. Set realistic expectations so you are not disappointed if your body does not change as much as you would like. Speak with a physician before embarking on a new diet and exercise routine to make sure it's a safe and healthy plan for you.